Artists can be very busy, often working longer hours per day than is reasonable. This can also mean malnutrition! How about some quick or time saving recipes, the kind that pack a flavorful punch, and is healthy to boot? I'll keep adding a link to new recipes to this list as I keep adding them in the blog. I originally published this in July 2011. 4 years later, I make it a bit different, and tonight, I found the NEXT LEVEL of this drink, so I figured I'd update the method! So refreshing, so smooth and flavorful, you'll likely never be able to enjoy the commercially available iced tea imitations. They usually are way too sweet, the taste is too diluted, and there are many unwanted and unhealthy ingredients. This drink will impress your guests! 2 tablespoons of loose leaf organic Mint leaves (dry). Take a very clean frozen lemon (rind and all), and grate about two tablespoons (use an organic lemon, scrub-clean very well before freezing!). Pour 4 cups of almost boiling water over the tea and mint leaves, let infuse for about 15 minutes. Strain out the leaves,pouring the liquid into a regular sized pitcher. Add half a cup (or less) of natural sweetener (cane sugar, or maple syrup, or brown sugar, or honey) while it's still hot, and blend well. Add the grated lemon. Add enough ice cubes to fill the rest of the two liter pitcher, and stir until it's all cold. This means you can drink it immediately!!! This can be made with only the green tea, same quantities, just replace the mint with more tea. Grated Lemon is optional, but WOW, it adds depth to the experience, and it adds more vitamins to the body!. Thrifty: infuse the leaves a second time, for a weaker tea. Still delicious! Use less ice this time, to not dilute the taste as much. I don,t have two pitchers, but I have a glass jug to keep the second batch. 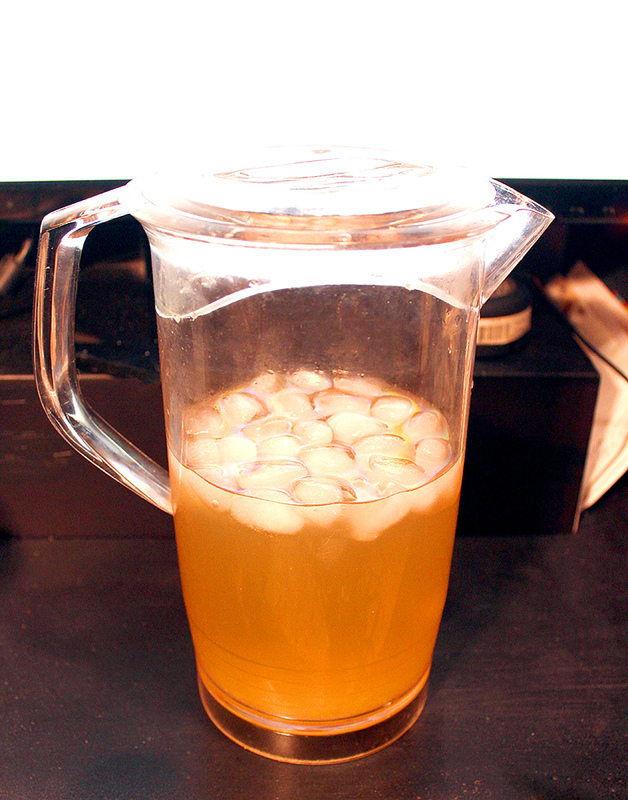 •Adding Mint seems to turn this Iced tea into a powerful diuretic, especially for new drinkers of green tea. Prepare to "go" often if you drink more than two glasses. This seems to have more effect on the new drinkers. I'm used to it, I don't see that unless I take three glasses in a row. •This stuff is addictive, and not only for taste. If you're not used to drinking green tea regularly, and fall in love with the taste of this Iced Tea, make sure you don't drink a whole pitcher per day for a few days, then stop drinking it suddenly. I learned by experience that the withdrawal symptoms are real. Nothing too serious, but annoying nonetheless: a medium headache.